It’s a bit of a sticky situation in the beginning, but the kitchen smells absolutely amazing! I am, of course, referring to these Oven Roasted Sugar Almonds. This sugared almonds post was originally published on November 27, 2014. Updated on November 25, 2017. Sugared almonds make the best hostess gifts! Are you looking for an edible hostess gift that can easily be made in advance and is super simple to make? 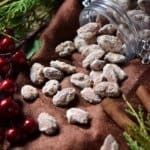 Allow me to share one of my favorite foods to give to family and friends throughout the year, but especially during the festive holiday period. We begin by whipping some egg whites and incorporating the sugar and spices. Equally important is spreading this very sticky egg white almond mixture in a single layer on a large baking sheet because these almonds are going in the oven. You will have to wait one hour, but your patience will be rewarded with a crispy candied almond. During that one hour wait, it is important to stir the almonds every 15 minutes or so. allow the mixture to properly dry out. 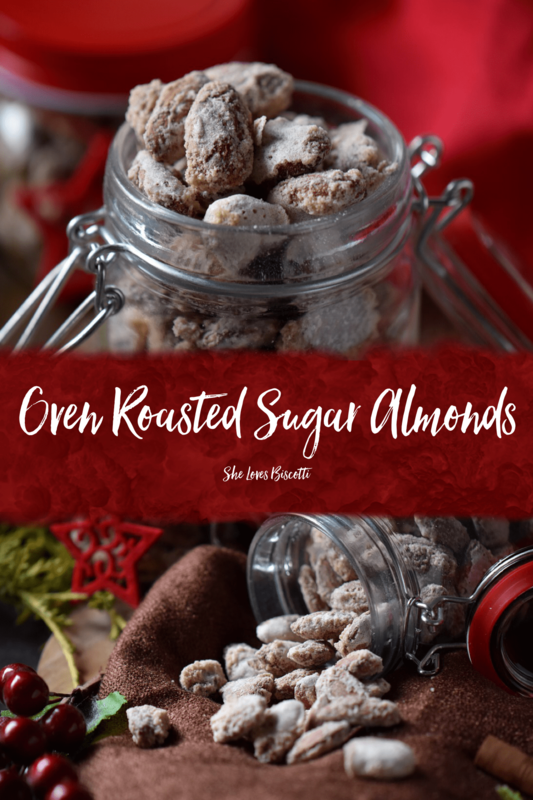 You will begin to notice (and smell) that something amazing happens when the wet ingredients in this recipe slowly evaporate… the sugar begins to crystallize and before you know it, this crunchy cinnamon flavored sugar crust adheres to your almonds. So don’t forget to stir them around because it really is key in order to obtain some crispy Oven Roasted Sugar Almonds. During the last few minutes of this process, you will notice that the sugar becomes very powdery. That is your cue to remove them from the oven because they are done. You have just created the perfect hostess gift… and just in time for the holidays! If you prefer, you can replace the almonds with pecans, walnuts or any other favorite nut. add a few to your favorite salads, yogurt, or even cereal bowls for an extra crunch! 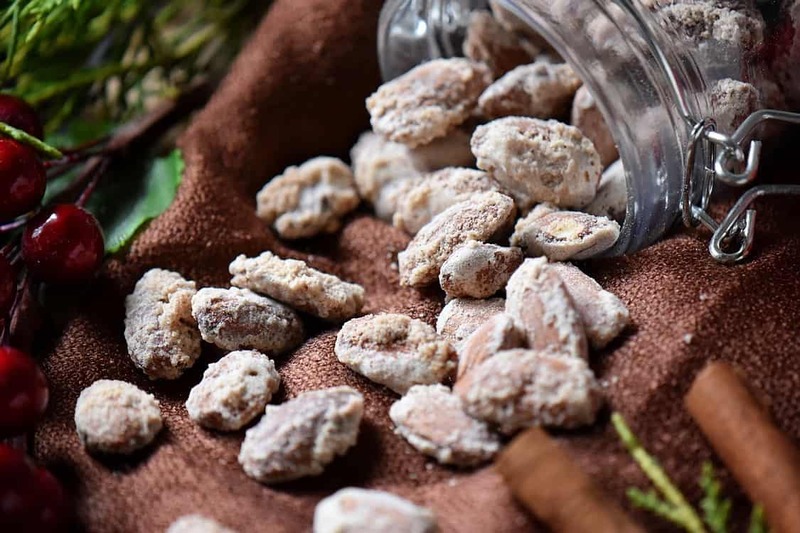 My “aha” moment happened decades ago when a friend of mine, Anna Maria, gave me a beautifully decorated mason jar filled with these Oven Roasted Sugar Almonds as a Christmas present. Naturally, I asked her for the recipe, but I remember thinking what a great idea this was. 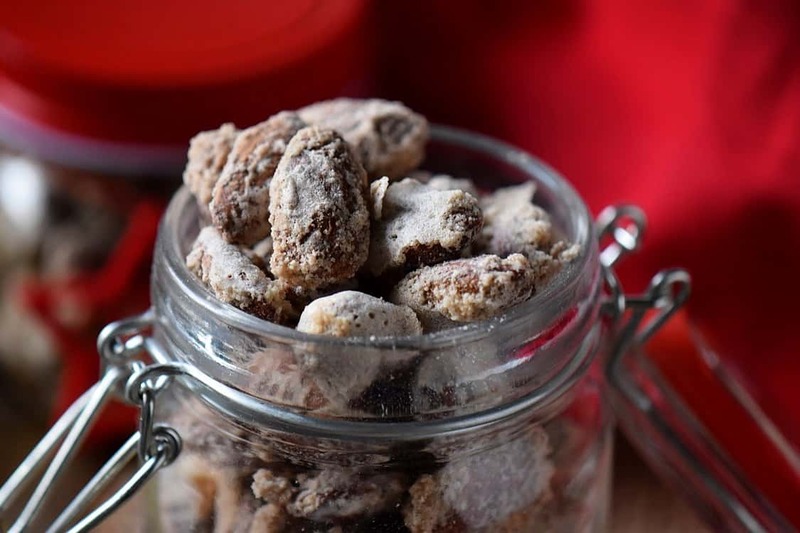 Since then, I have always included these Oven Roasted Sugar Almonds as part of my holiday baking marathon. 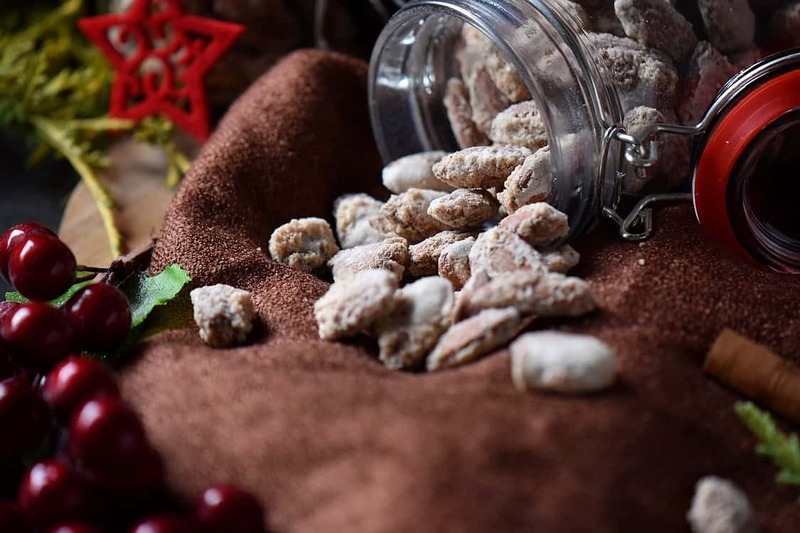 This holiday baking marathon of mine always begins with biscotti that freeze well (like these Almond Biscotti) and special treats… just like these Oven Roasted Sugar Almonds. Have you started baking for the holidays? Would love to hear about your special recipes! 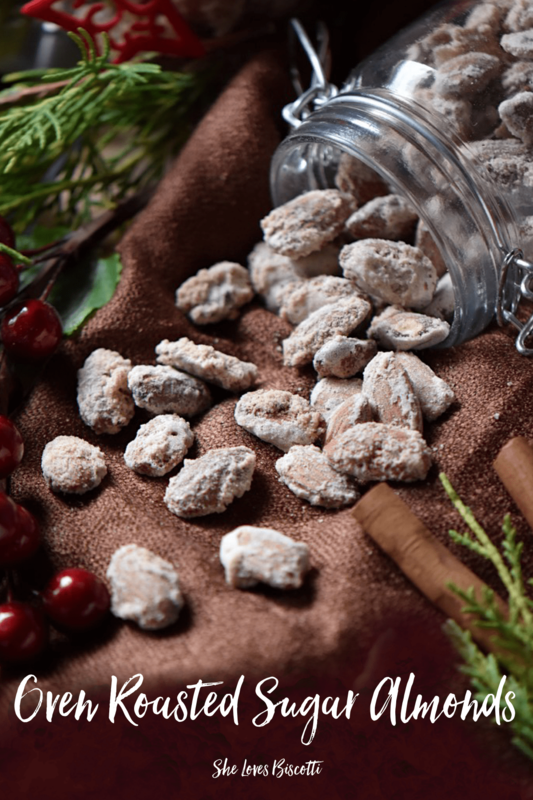 These Oven Roasted Sugar Almonds make perfect hostess gifts. Easy to prepare and can be made well ahead of the Christmas rush. Using an electric mixer, beat egg whites on medium speed until you reach the soft peak stage (2-3 minutes). Continue beating while adding water and vanilla extract. Gradually add the sugar, cinnamon and salt. Stir until combined. 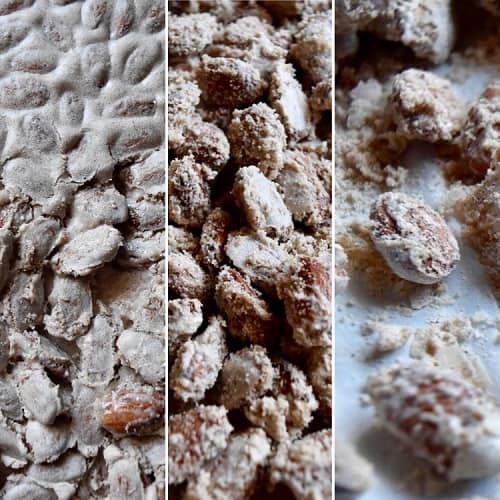 Combine this sugar mixture with the almonds. 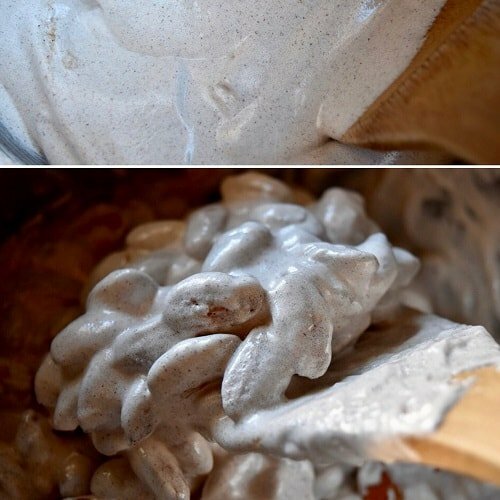 Ensure almonds are completely coated with this mixture. Spread on baking sheet. Almonds should be in a single layer. Bake for 60 minutes, stirring every 15 minutes or so. You can also substitute 1 cup of the granulated sugar with 1 cup of brown sugar. You can use any kind of nut to make this recipe. LOVE THIS POST? PIN IT TO YOUR HOMEMADE CANDY BOARD! My almonds are cooked on the stove until fragrant then you set them aside. You mix honey, sugar, cinnamon and salt together and put it in the pan, stirring the mixture that add the almonds and coat well with the mixture. Then pour them on a cookie sheet with parchment paper. Let cool for 10 minutes and separate them. They are sticky and I want to package them for favors. What do I do so they will not stick to one another when I package them.? Hi Patricia, the almonds are not cooked on the stove… the egg white mixture is mixed with the almonds and then baked for an hour in the oven. As they bake they will get hard and separate but you need to stir them around and break them up every 15 minutes or so. Please let me know if you have any other questions. Do you mean blanched almonds or the ones still in their skins? Will make them on Sunday. Only 1 change – use coconit sugar instead of white. G index is 35 isteard of 100 for white sugar. = eat more – less calories. Yum. I will definitely make these for my cookie platter. Next year I will make these for my friends as we exchange a homemade Christmas gift each Christmas at a potluck dinner. This year I resorted to assembling different tea in a holiday tin. I wish I had a way of adding honey on stick but haven’t been successful in finding. Thanks for your recipes. I am so happy I stumbled upon your site you have no idea!!!!! what about already roasted almonds?